In April, Hojin Sensei and senior monastic Yukon Grody attended a screening of a new documentary about Thich Nhat Hanh’s monastic community, sponsored by the Rondout Valley Holistic Health Community and the Rosendale Theater. Afterwards they led a lively discussion with 200 audience members about the monastic life. Downstate in April, Hojin Sensei met with residents at the Brooklyn YWCA where she gave beginning instruction in zazen, the start of an on-going program which has been warmly received. In May, Shugen Roshi traveled to Buffalo, offering a public evening on Loving Kindness: A Talk on the Metta Sutta, a discussion evening on The Unexpected Gift of Karma, and to officiate at the wedding of Buffalo sangha members David Nelson and Christine Mawhiney. Also in May, Zuisei Sensei visited and gave a presentation for an open house at the new Middle Way School in Saugerties, NY. To keep ourselves inspired, informed, and connected in social justice and environmental action, Dharma Action will hold quarterly events for the MRO sangha and the wider community featuring films, speakers and artists in areas relevant to our work. Interested in learning more about Dharma Action and our projects? Come to an event, or send a note to dharmaaction@mro.org. We Offer Candlelight, Environmentally Friendly. As part of the Monastery’s efforts to wean ourselves away from fossil fuels, sangha member Sansho Benton has been perfecting a recipe for our own altar candles. These candles are made using 50% white beeswax combined with 50% soy wax. It took many months of experimentation to finally find the optimum wax mixture and proper wick size that will burn slowly and efficiently for many hours at a time. The candles formerly used were composed of paraffin, a petrochemical, which is a byproduct of crude oil distillation. The new candles are non-toxic and significantly more environmentally friendly. We have been using these candles on all of our altars with good results. Home altar candles of the same composition are also now available for purchase at the Monastery Store. On Sunday, May 13, 2018 Shugen Roshi officiated at a Jukai ceremony for three students formally taking the Bodhisattva precepts: Lyn Chosen “Serene Waters“ Mattoon, Danise Eiko “Eternal Peace” Malaqui, and Carolyn Keirin “Facing the Jewel” Alif. 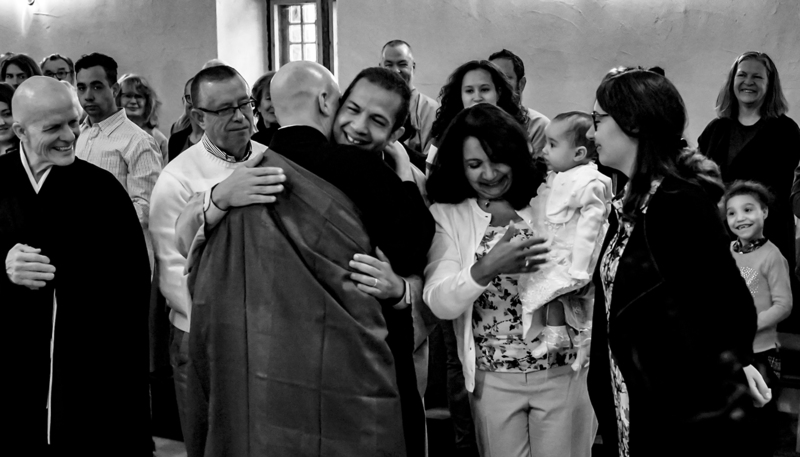 On Sunday April 16, 2018 the Monastery sangha welcomed Luna Marisol Ramona Pena, daughter of Juan Tenke Pena and Stephanie Maria Pena, at a Newborn Ceremony officiated by Shugen Roshi. Many extended family members joined sangha friends for the ceremony and the morning program. 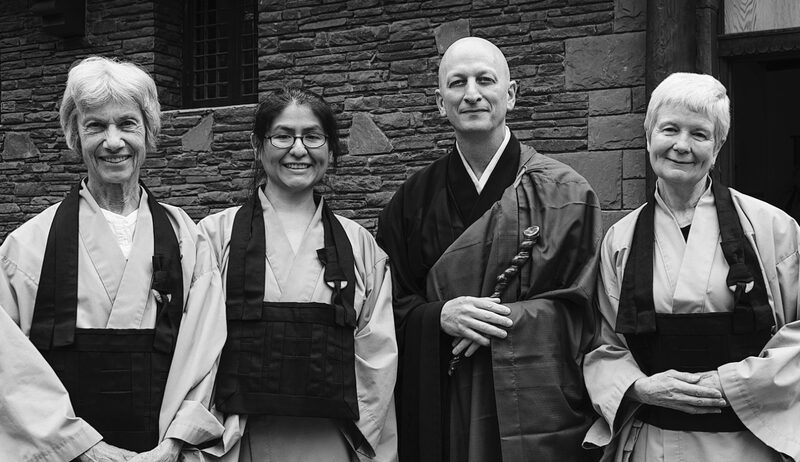 This spring, Luka Mokudo Valentino, Roo Carroll and Tasha Ortloff for Shugen Roshi, and Simon Harrison, Marco Poggio, Marie Ringo and Laura Lamash for Hojin Sensei, all passed through the five barrier gates to become formal Mountains & Rivers Order students. The Monastery would like to thank all of the bodhisattvas who continue offering their assistance at the Temple, the Monastery, and at all our affiliate groups. Gratitude to Wayne and Kathy Settimi for the donation of a Nissan Versa to the Monastery car fleet. Generous garden support has come our way from Bill Amadeo and Ric Ryoha Dunworth, and foraged edibles for the kitchen from Tasha Ortloff and Shinji Hoffman. Gratitude to Polly Horne for an air conditioner for the Temple. Deep bows for stitchery assistance from fusei forth, Claudia Young, Koho Montadert, dye studio assistance from Ikyo Love and Seiyu Lanaghan, and to Takusei Twitchell for the large cutting mat for the stitchery. To all of those who submitted photos for the issue we are indebted, please keep shooting and keep sending us your work! New resident at the Temple in March was Josue Ramirez. In May we said good-by to Yudo Abraham who completed eight months of residential training, to Busan Mannion completing a six-month staff residency, and welcomed Jean Ann Wertz beginning a six-month residency as Temple staff.